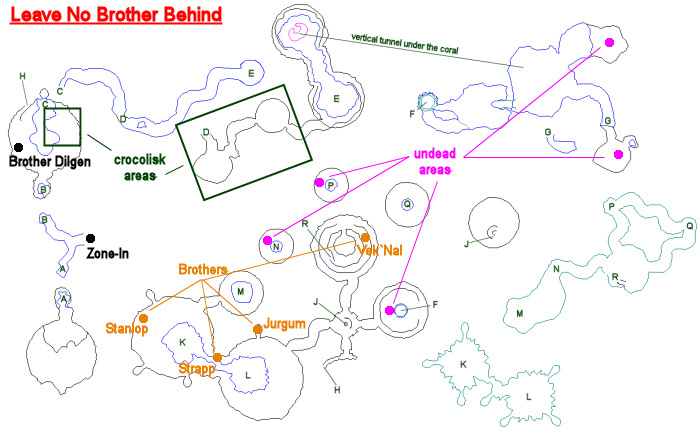 This solo task begins with Brother Dilgen (click for map image) in the cave just north of the zone-in. Say obtain to request the task. You have been assigned the task 'Leave No Brother Behind'. Brother Dilgen wants you to collect supplies and help save his brothers from the sirens. "Salty Rusted Sword" can drop from any regular skeleton or floating skeleton mob (very common or 100% drop rate). Crocolisks are found in the same cavern as Brother Dilgen as well as the above-water area to the east. They tend to hit for a max ~17,000 and are mezzable. You receive a Chastity Helmet Set. These steps are all open at once. 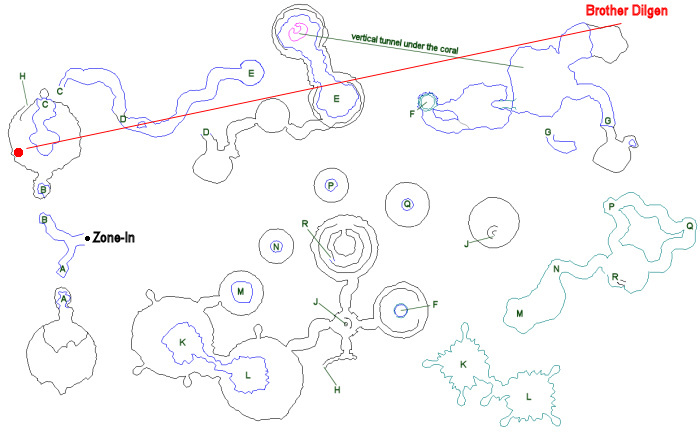 Three of the Brothers are in the cavern to the west, and another is in the cavern to the north. Each Brother is leashed to within about 100' range of their spawn point, hits for a max ~12,000, and is immune to mez. Each has 1-2 sirens next to him (hit for a max ~6,000; immune to mez; sirens are NOT leashed). All three mobs are aggro-linked. Brother Stanlop covers his eyes and ears. 'Must not look! Must not hear!' He runs for the cavern entrance without looking. NOTE: If you need these task updates, you must be on the Brother's hate list or else it won't update for you. Thanks, added in the quest and changed up the formatting a little of the quest entry so it can be read a little easier. The crocs share turtles as spawn points so you can get those drops around the lake where the quest-giver is if you don't mind clearing both types of mobs and waiting for crocs to pop. The undead are easy to find so no headaches there. The Brothers sound harder than they are. * The Brothers and their siren "friends" see thru invis. * They cannot be split. Trust me, I tried. Impossible. * They cannot be mezzed. Altho the enchanter's "deep sleep" debuff from mez spells WILL land. *They respawn VERY fast. The fight was so easy I tried in one to kill all 3 before repops and couldn't do it even with mage/wiz burns. * The Brothers and their sirens hit very softly, relatively speaking. During one of the four fights we accidentally aggro'd "an adolescent spineback" and this immature snapping turtle was a bigger danger than any of the quest mobs! ** You don't have to kill them all, just beat the Brother down to 50%, one person right-clicks the helmet and you're done. Hope you have an evacer in group! Note: you just right-click the helmet while targeting the Brother. At first I tried to give it to him and that didn't work! The "use ability" takes 1 second to cast so best maybe not to have the tank do it as he might be interrupted. BIG NOTE: you do NOT have to damage them to get credit. You just have to be on the hate list of the Brother. Our cleric only casted heals and he got the flag. For what it's worth, the sirens don't mezz, but I can use the fire pet on them to lose agro so they must memblur. I actually was near one of the brothers when another two guys were going to pull / tank etc him. Also the sirens were wimps. at 103 I ignored them and merely tanked the guy and die my AOE Righteous Beacon one time and it was no problem. I succored out after. My main thing was I would invis my mage, run to a safe spot COH the whole group and call it a day. Make sure everyone in the group that needs the update is on the brother's hate list. We had a member of ours medding out of combat and they did not receive the update and were forced to do it again! Just did this with warrior, monk, shaman, cleric, chanter and merc healer. The sirens are NOT mezzable so we just tanked them while we took him down under 50. Our problem was trying to drop aggro after we did the helmet thing as the sirens kept attacking and when the brother got back up over 50 he started attacking again. Our solution was fd pots for after we did the helmet thing to drop aggro...worked like a charm. Best to mez sirens next to Brothers, as stated they are very fast spawn again. On the weaken brother part, you must do damage, or use some detrimental ability on the brother in order to update the task. Healers take note. Weakened to 50%, one click from any group member does it for all the members.